Another one of my favorite micro receivers is the OrangeRx R410X DSMX Compatible 4Ch/6CH PWM/CPPM 2.4Ghz Receiver.Yet another Spektrum compatible receiver at an affordable price range of $12. This is a true DSMX compatibility signal that utilizes dual antennae providing true signal reception diversity. It has a programmable fail-safe, fast brownout recovery and wide voltage input. 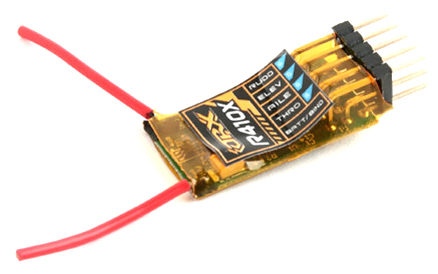 4 channels, weight around 2.7 grams, making this the lightest of all micro receivers.